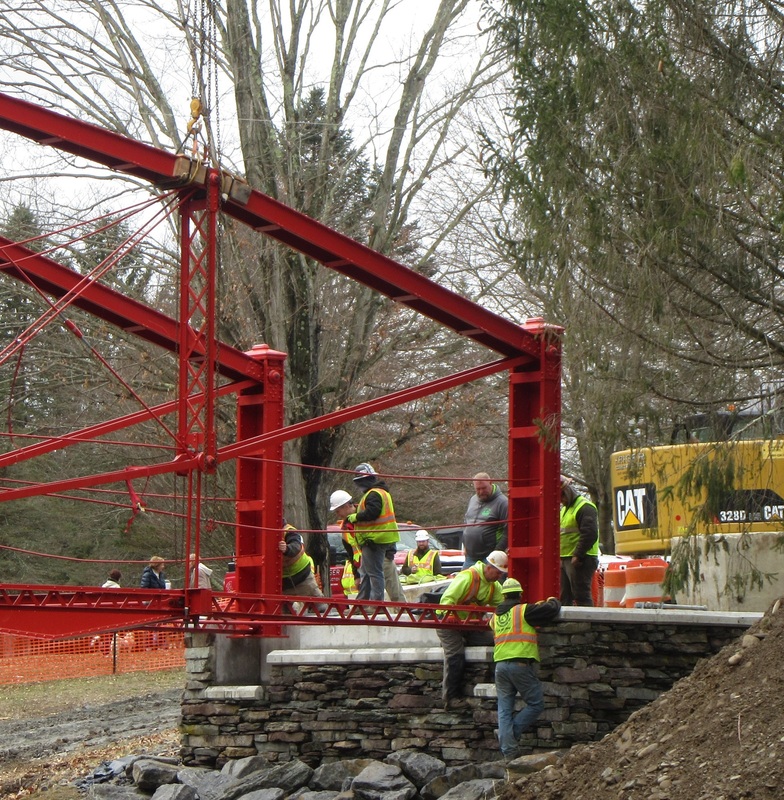 It takes a lot of people combining foresight, funding, engineering skills and patience to move a 140-year old, 50,000 pound bridge seven miles downstream, where it can now be used and appreciated for another hundred years or more. Originally erected in 1878, the bridge spanned Tunkhannock Creek on Savage Road, currently known as SR 1029 off Route 92, south of Nicholson. It was one of many bridges deemed structurally unsound after the 2011 flood and was closed. It now spans the overflow gully in Lazy Brook Park, replacing a bridge that was washed off its pylons during a late spring flood in 2006, wrapping itself around a black maple tree. What is now a Tunkhannock Township park was then still a thriving neighborhood to hundreds of people. The over-washing by Tunkhannock Creek was its second in two years and subsequently led to a buyout and removal of all of the homes. 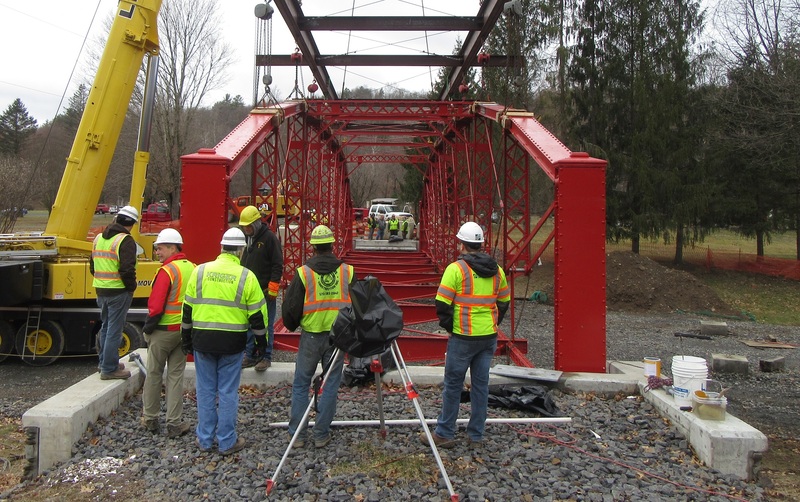 The renovation and relocation of the lenticular truss bridge cost approximately $175,000 in federal and state funds, and the township and company officials holding their collective breaths as it was being lowered into place today strongly feel that it is worth it. “We don’t build anything like this anymore,” said PennDOT bridge inspector Ryan Vitaletti, one of two project managers. Of the three bridges of its exact type known to be in existence in the United States, Vitaletti suggested that this bridge might be the oldest. “We’re preserving a piece of history,” Tunkhannock Township secretary Judy Gingher stated. “Since it was from our county, it should stay in the county.” Tunkhannock Township paid PennDOT $500 for the bridge in 2015. At the time, plans were to have it dismantled, cleaned up, and reassembled in its present location within a year. 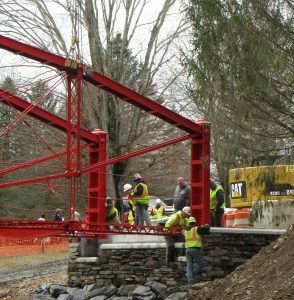 “When it was all cleaned it off and we looked at it again, we saw additional pieces that needed to be repaired or reproduced,” said project co-manager Bill Grunza of Kriger Construction of Scranton, which then turned to Pelet Welding of Coatesville and Bach Steel of Holt, Michigan to renovate the structure. Pelet did the fabrication of new parts, which were then shipped to Michigan for hot riveting by Bach, which specializes in rescuing old bridges. The need for more new pieces set the project back a few years until Bach could reschedule its role in the renovation. In the meantime, new piers were constructed at Lazy Brook Park in preparation for the eventual arrival of the bridge. The wait was a long one for township officials, who also cited McCormick Taylor Engineering as integral in the project. With a crane from Lane’s put in place this morning, Kriger employees meticulously dismantled the temporary steel frame built around the bridge, and it was set free, dangling by high cables as it was slowly turned and lowered into place. Engineers and inspectors agreed that the refurbished span was a perfect fit for its new foundation before it was lifted in the air again. Base plates and bolts were set into place with an epoxy grout, and the bridge was lowered again where it will sit for a few weeks until another inspection. At that time, new timber stringers and decking will be applied that will bring the floor flush with the approaches. Some bolts and plates have yet to receive their first of three coats of red paint, and a railing will be installed using hardware specially manufactured for old bridges. The paint job should last at least 20 years, related township roadmaster Kenny White, whose goal it is to have the approaches completed and the site completely cleaned up in time for the NEPA Bluegrass Festival that will be held in the park June 1 to 3. Even though the handicap-accessible bridge will have a six-ton capacity, it will be used only by pedestrians, cyclists, and park maintenance vehicles. Though a few of the dozen or so spectators that gathered to watch today’s event thought it appeared that the new bridge sat a bit lower than the one that it replaced, White assured them that it was actually a foot higher. The gully has been built up with layers of crushed stone to provide a solid base for the heavy equipment. That and eight temporary column foundations will be removed before grass is resewn. “There’s a lot more to it than I imagined,” township supervisor Glenn “Ace” Shupp said of the project. He has done a lot of research on the bridge that will be part of a rededication ceremony in May. Though it had been hoped that the event could take place on April 16, 140 years to the date of the original dedication upstream, the project will likely not yet be completed.